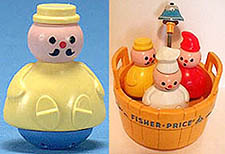 Like the old saying goes, "Don't count your Little People (or their chickens) until they hatch"...or at least until you can properly identify the many different types of Fisher-Price characters that have been made. Since many collectors and hobbyists aren't experts (yet), we've put together this quick comparison display so that you'll not only know what you're looking at, but what you should properly call him or her. And if you still don't recognize your guy or gal here, then you may want to hop over to our Imposters page to see who else it might be. Comments: These are the original "Little People". Most are approx. 2" tall. For a complete list of every known Original Little People figure, click here! Comments: These look like super-sized versions of the original "Little People". Approx. 3-1/2" tall. They were primarily used in infant bath toy sets. For a complete list of every known Jumbo Little People figure, click here! Comments: These figures were sold both with the #980 ATV Explorer and Construction Truck Series of toys. Measures 3" tall. For a complete list of every known figure, click here! Comments: These figures have a round (1-1/2" diameter) base, and their arms are finger-size to allow for puppet play. Measure 3-1/2" to 4" tall. For a complete list of every known Woodsey figure, click here! Comments: The first replacement of the original "Little People", they were introduced after safety concerns were raised by consumer groups. Original Little People, it seems, could be swallowed by small children if they came apart --- rare, but it did happen. Approx. 2" tall. For a complete list of every known Chunky Little People figure, click here! Called by Collectors: Late model plastic figures with arms, or "Armies"
Comments: These characters have a look of their own, sorta look like Cabbage Patch dolls in the face! They're soft, squeezable, and measure approximately 2-1/2" tall. For a complete list of every known Current Little People figure through 2000, click here! Comments: These figures were used in the #142 Three Men In A Tub set. For a detailed list of these figures, click here! Comments: These people look like doll house people, but were mainly toys for boys. They are 3-1/4" to 3 3/4" tall. For a complete list of every known Adventure Series figure, click here! Comments: These big chin, big armed, and big chested guys can tackle any job! Since they were only made for a few years, they're a bit hard to find. Appx. 3-1/2" tall. For a complete list of every known Original Husky Helper figure, click here! Comments: These figures are approximately 1-1/2" tall and wide. For a complete list of every known Tumblewheel figure, click here! 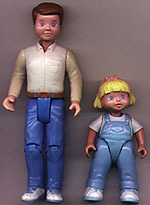 Comments: These figures are very large; the little girl is 3-1/2" tall and the parents are 5-1/2" tall. These figures have "93 F-P INC." cast into the bottom of their shoes. For a complete list of every known doll house figure used from 1978-1985, click here! Comments: These big footed guys are sorta like the Husky Helpers of the 90's! For a complete list of every known Rescue Heroes figure through 2000, click here. Comments: Confusion runs rampant with these figures. Like the original Little People sets, these figures also come in a western set and a castle set. The castle actually looks very much like the original Little People castle, so be careful not to confuse the two. Appx. 2-1/2" tall. For a complete list of every known Great Adventures figure through 2000, click here.